this is crap.Sorry,but i as a woman see how unfair this is.We dont tell women treat all men.That would be considered wrong.So why tell all men to respect all women? this is just more feminism. The title: “Respect. Women. Full stop” is saying the following: Respect as a concept, self-contained, then the concept of women, another self-contained concept. Then the phrase, “Full-stop,” which is redundant, where you have periods after “respect” and “women.” The brain, perhaps related the two, as in “Respect women,” but the title is not making a command. It could also be saying that “respect” and “women” are two things in a series. One of the problems in associating respect with women is that A. A person’s respect comes from respecting themselves and B. If you have to command someone to respect women then I don’t see how this will ever happen. It is not a gender issue, except in the sense that men should, it goes without saying, respect women in the sense that in doing so affirms the definition of a man. And this is purely a heterosexual perspective, but a man cannot be a woman, who she is in terms of her differences, whether physical or mental, whatever. 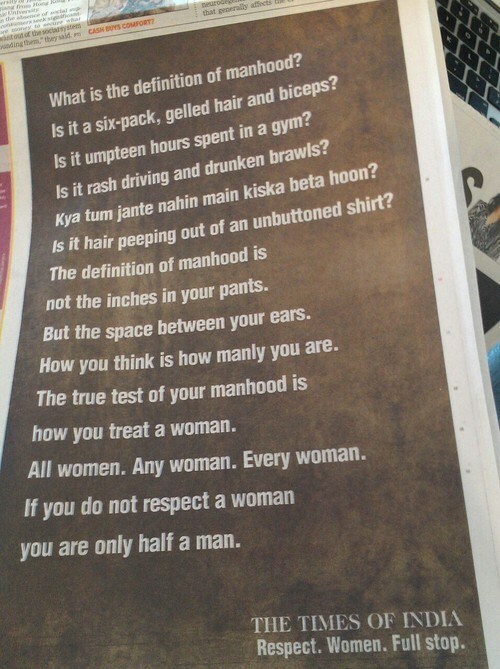 In acknowledging who or what a woman is, we should respect the difference. She brings the other half of the equation, heterosexually speaking. A question was posed to me regarding when I found a woman I liked, I was to ask myself what it was about her that catches my attention. The woman, who came to mind at that moment was “R-.” I met her at a dance. She was about my height. She seemed taller and confident. She had a Cleopatra haircut. I told her not to hate me since I was awkward since it was my first time Contra Dancing. She said, “I don’t hate you.” I had accidentally hit her in a breast as I went to react to her lead by catching up to the step she was in. I remember coming up to her hair and not smelling anything, you know how you can tell if someone has drunk from your glass if it smells like saliva. Well, she did not. She had a cute, Latin-American face. She seemed smart, definitely an upper-division graduate, but I couldn’t tell. She had this no-nonsense attitude and I could tell she wasn’t interested in me, but I liked how she carried herself and so she helped me through this particular dance as my partner. I respected her because it felt like she was having to tolerate me. The woman I came with said that she wasn’t that good of a dancer. I was surprised. She seemed to accurately place us as we danced together. She was beautiful to me. There was another woman too, who would stare into my eyes and I felt like I was electrocuted. I doubt she really cared as we spun. She was dancing and that’s what people do when they dance, in this case, and so she had me. Besides, she was beautiful. I never really know what women like this are thinking. I sense it is not attraction but a kind of sizing up and I always allude to my attraction, but of course, it probably doesn’t matter. I haven’t seen the woman who stared into my eyes and looked into my soul. That saddens me. I actually think she gave me the opportunity to chat with her as I found her standing next to me for a moment as we were in the room with all the shoes. I didn’t say anything to her since I was both unsure and besides, I didn’t want to start something in front of the woman, who brought me. But, of course, if I were interested in her it meant that I wasn’t interested in the one who brought me. I’ve been in this place a thousand times. That’s why I am single. I won’t go on because in thinking about this, I’ve realized that I am attracted to strong women. Being attracted to them implies that I respect them. I can go back and tell you about all the women I have loved. They have all been either well-educated or confident. I don’t think it is possible not to respect women because it means in not respecting them, I do not truly know who they are. Not knowing who they are implies my ineptitude and lack of depth not theirs.